Polynesia, in the Pacific Ocean, is made up of several thousand islands. New Zealand is the largest country in all of Polynesia. Most of the islands are famous for their natural beauty and wildlife. Bora Bora, for example, has to be one of the most instagrammable places on the planet! Polynesia is a popular holiday destination, especially for honeymooners, because it’s practically paradise. White sand, palm trees, tropical flowers and crystal clear water are just some of Polynesia’s most attractive qualities. Not to mention their beautiful women! Polynesians are famous for their music, their art and their dancing! The Polynesian Beauty in this slot game is wearing a traditional outfit, including a grass skirt and a flower in her hair. She’s stunning and a wonderful dancer, too. You’ll get to see her in all her glory during the Free Spins. 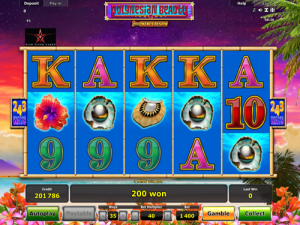 The Free Spins round in Polynesian Beauty – 2nd Chance Respin is great. You can choose which type of spins you want and all of them come with win multipliers! There’s a Scatter symbol and a Wild symbol in this Novomatic slot game. You can gamble wins and you can play manually or in auto mode. Polynesian Beauty – 2nd Chance Respin has 5 reels, 3 rows and up to 243 ways to win! You can choose to play with 243 ways to win or with fewer paylines. Like with the majority of Novomatic slot games, the settings are all found and can be adjusted at the bottom of the screen. This slot is the perfect choice for those of you who love to play other games from Novomatic, like: Lava Loot, Asian Attraction, The Real King Aloha Hawaii and Gorgeous Goddess. This slot game celebrates Polynesian beauty in all of its forms. The background, visible behind the reels, shows a Polynesian sea view at sunset, complete with palm trees and bright orange flowers. The sky is a wonderful mix of oranges, reds, pinks and purples. The symbols also celebrate the beauty of Polynesia and one Polynesian beauty in particular! Aside from the 9, 10, Jack, Queen, King and Ace, the symbols are all themed around Polynesia. There’s a multicoloured hibiscus flower; a beaded necklace; two painted shells; a wooden mask; an erupting volcano and the most beautiful of all the Polynesian women. The Volcano symbol is the Scatter and the Polynesian beauty is the Wild symbol. Three matches are needed for a payout. Payouts are also awarded for four and five matches. Matches must fall from left to right and be consecutive (i.e. the matching symbols must fall successively on separate reels, starting from reel 1 on the far-left). This is if you’re playing in 243 ways to win mode. You can also play with fewer win lines and you can check the paytable to view these. The Wild symbol, aka the Polynesian beauty, can stand in for any symbol but not for the Scatter. The Scatter symbol pays from any position and also triggers the Free Games feature. 3 or more Scatter symbols in view will trigger the Free Games feature. Rather than just an ordinary Free Games feature, you can choose how many spins you want and which multiplier you want! You can choose to get 18 Free Spins with multipliers of x3, x5 or x8; 13 Free Spins with multipliers of x5, x8 or x10; 10 Free Spins with multipliers of x8, x10 or x15; or 8 Free Spins with multipliers of x10, x15 or x30. If you can’t make the decision yourself, you can choose ‘Mystery Spins’ and the game will decide for you. During the Free Spins, the 2nd Chance Respin Feature is activated. Whenever a Wild symbol lands on the reels, the Polynesian beauty will expand to cover the whole reel she landed on. She’ll do a traditional dance and give you payouts! If she doesn’t help to get you any payouts, she will stay in place whilst the game gives you a 2nd chance by giving you a free re-spin!